NEW: Buy 2 items (or more) and get a free upgrade to 1st Class UK postage. PRO9 has established an outstanding reputation as Europe's No.1 source for information on American Pool in the UK and Europe. Upcoming tournament details, prompt match reporting, exclusive images by talented photographers, superb articles by expert pundits, active pool related forums, player profiles and a very sophisticated membership - basically, an incredible information resource for the American style game in Europe. Since it launched, PRO9 has become compulsory reading, not just for the UK's pool players, but to hundreds and thousands of pool obsessives from around the world every single day. 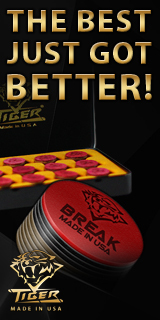 PRO9's members range from professional pool players, cue-sports enthusiasts, club managers, tournament organisers, pool fans and aficionados, as well as various "movers and shakers" in the cue-sports field, including entrepreneurs in the wholesale and retail sector, as well as magazine editors and television sports promoters. Growing more and more popular every single year, PRO9 is the best placed vehicle for the promotion of your pool club, billiards brand, associated products, services and opportunities in the truly massive pan-European billiard market. 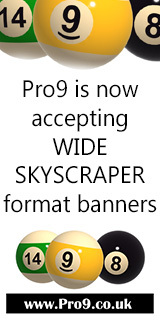 If you're reading this, you should check out www.Pro9.co.uk for yourself! Please use these logos and text in your links to www.Pro9.co.uk - thank you. Forum rules: No advertising, no links to businesses/shops/eBay, no swearing, respect our sponsors and each other, no hate! The comments are property of their posters, all the rest � 2006/2007 by Big Dave at Pro9.co.uk. This web site was made with myPHPNuke, a web portal system written in PHP. myPHPNuke is Free Software released under the GNU/GPL license. I didn't think anyone read this bit down here!!! Page took 0.212841 seconds to load.